New Year’s Eve, Part Deux! Am I EVER glad I documented this year. It’s shown how far I’ve come, even though some days I felt like a bambi on skates or a pylon. I have a lot of things to be proud of and a lot to still work on and look forward to. 2012 is going to be a year of hard work, for sure! Like many sports and news shows are doing retrospectives, I’m doing a year in review of the goals I set on this very day last year. The original post can be read here, with the followup post here. It’s not necessary to read my 3 month, 6 month and 9 month progress (but if you really want to, links are provided) because I have my goals outlined in this handy-dandy chart! Charts are awesome! NERD POWER! You can see I still have some things I need to work on. And that’s TOTALLY OKAY when I see how much I’ve accomplished. I’m proud of myself for sticking to my plan. Now with all these fitness and nutrition goals I’ve set, it was bound to have an effect on my body performance and shape. I have to say, I’ve impressed myself. Not only am I stronger and more solid on my skates I started to see these weird bulges show up on my body that turned out to be muscle. I realize by simply adding strength and muscle won’t make me a better skater until I figure out how to use it to my abilities, but for now I’m reveling in the fact I have muscle. I’m kicking myself I didn’t take a before photo last year. So this is the closest one I could find that shows my body. I’m not overweight or particularly unhealthy, but I see some definite soft spots that needed a lift. 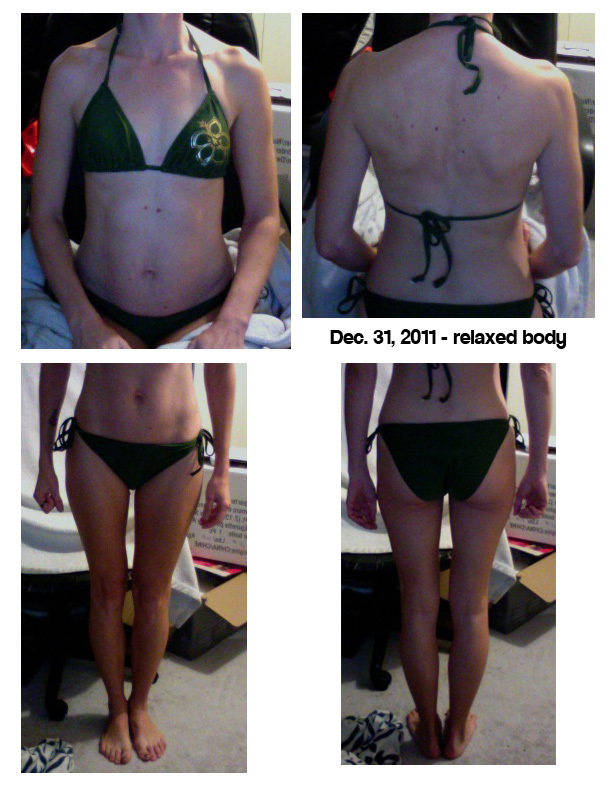 For anyone writing goals for 2012, TAKE BEFORE PHOTOS! PLEASE! Head game, head game, head game. Which means finding my groove to get myself psyched up for a game, find ways to keep myself motivated and positive when things don’t go right and focus on strategy and playing smart. Be a more patient jammer. I saw this time and time again while watching worlds. If a jammer was faced with a wall of three, they didn’t try and crash through… they would hop around and wait for the opening. I’ve come to realize that last year I would get impatient and either back block or cut the track. More intricate footwork. I’m getting really comfortable on my skates. I want to be able to hop forwards, backwards, sideways, onto my toes and have it be instinctual so it’s another tool in my tool kit when playing. Fix my neck and shoulders. Years of chronic tension isn’t doing me any favours. I need to really focus on getting those muscles working right. Lift heavy, like the big boys. Going into 2012 I’m on 15 lb weights, each hand (sometimes 20 lb depending on the exercise). I really want to work up from that. Gain weight in muscle. I’d love to see another 10 lbs added. In order for me to do that, I’m going to have to…. Go Paleo. That’s the only way I see myself making gains. Protein is my friend. Don’t worry, it’s not a carb-free diet. I just get my carbs from sources other than grains. I think I’m going to have to buy a book on this one. I have no idea how to do this but I’m going ahead and giving it a shot. It’s just a new way I want to track progress. Final note: You can do this too! I want to encourage my readers to set small goals, document and celebrate when you’ve succeeded. I don’t think I would have ever stayed on track if I hadn’t had your support! So thank you for continuing to read! The benefits are huge, regardless if you’re in derby or not. I’m looking forward to my next year and hope you’ll join me in your own success too! PS: I successfully changed out my roller skate plates and will have a post on how I did that in the new year! In preliminary prep for the 2012 Moonlight run, I’ve hit the treadmill since taking a break after the 5 k I participated in last August. After focusing so much into building my upper-body strength, it was fun to change it up and do something different again at the gym this morning. I forgot how much I loved it. With the weight training I’ve been doing I have to stay focused to maintain my form and to not drop a weight on my foot. With running however, I can let my mind blissfully wander. I come up with my best ideas when I do my distance runs, from derby strategy to blog posts. It was really nice to get back to that. In addition to training for my next race, I also realized that I needed to make good on a promise I made in the goals I set almost a year ago. Stupidly, I set one of my running goals as to run a 6-minute-mile. I’m realistic enough to know I won’t get close to that, but promise to make good on seeing where I’m at in that comparison early in January 2012. I’m not sure if I’m going to try and treadmill test that or if I’m going to hit an indoor track somewhere to take that test. I guess I’ll figure that out after Christmas. On a positive note, I’ve faired well taking almost 4 months off of running, random coulee runs aside. Today I decided to start easy and comfortably did 3 miles (4.8k) in just under 30 minutes. That works out to 10 minutes per mile (6:25 minutes per km). My pace at the end of my running season I was at 8:13 minutes per mile (5 minutes per km) (That was for a 5k race). So considering I didn’t push myself hard this morning, I have a good start with lots of room to push myself and improve. Last year I did 9:46 per mile (about 6 minutes per km). The run up the massive hill at the end of the race is what killed me last year, so I plan on training specifically to beat that and get a better time. I would REALLY love to improve my pace from last year to get down into the 8-minute range. That means my finish time needs to be anywhere from 29:52 to 33:34. GAH! What did I just say??? My finish time last year was 35:47 so that’s a lot of minutes to lop off. It also gives me only 82 days to train, while keeping on top of my other fitness training that I plan on continuing into 2012. Not to mention derby practice. At the same time, I’m in completely different shape in comparison to last March. So even if I won’t be able to commit to running three times a week like I have for past races, I’m confident my other training will keep me conditioned enough to help me reach my goals. While saying that goal out loud is ridiculously scary, it also motivates me to push through and do my best to achieve it. Hi readers. A lot has been happening the last couple weeks so here’s a jumble of thoughts and things that’s been going on. 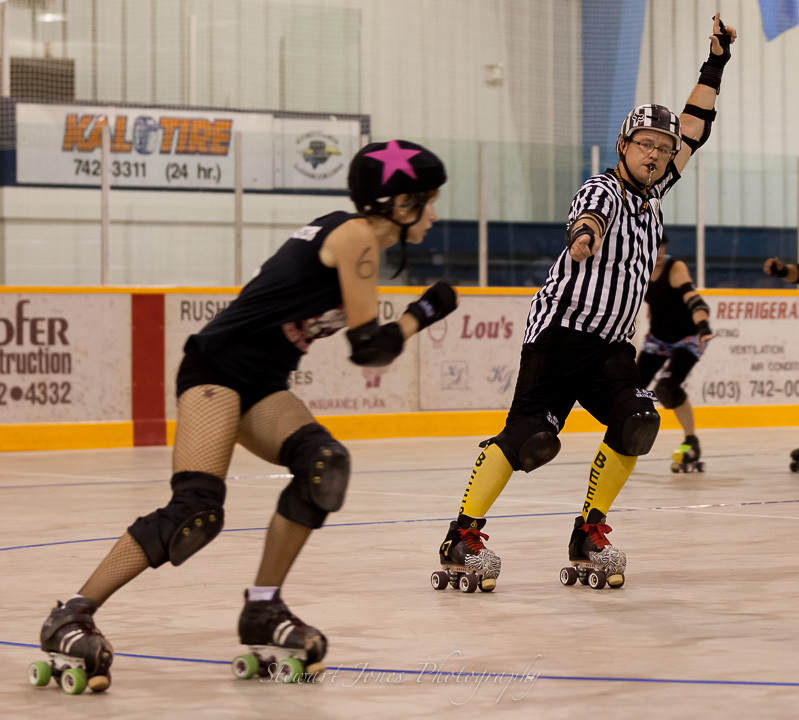 At December 3rd’s bout in Medicine Hat our team came out with a win which was so amazing. While our first half was a little inconsistent, during the second half our entire team meshed and things we have been working on so hard came to fruition. Watching jam after jam, every play was executed in textbook format. It was a beautiful thing and I was so proud of everyone. At the time of the hit I remember thinking that my neck doesn’t bend like that, even on a good day and at half-time I was met with shakey knees, dizzines and nausea. After getting checked out by the EMTs and chatting with my coaches, I decided it wasn’t worth risking a second blow and further injury. It was a good decision as the ride home was rough and I could barely move the next day. After a visit to the doctor, it was determined I didn’t have a concussion (whew!) but had a pretty nasty case of whiplash. X-Rays for precaution and a few chiropractic and massage appointments later and I’m feeling next-to-my-old-self. In my follow up my chiro didn’t notice anymore swelling in my neck and he’s given the okay to do some light contact. Sidney Crosby of the Pittsburgh Penguins has suffered a setback from his head injury, which happened in January. He made his return to game play in November but announced yesterday post-concussion symptoms have returned and he’s now out indefinitely. I just have to say what an amazing role model he is for professional and amateur athletes, contact sports in particular. I’ve seen my peers in roller derby skate with concussions, broken noses and the like. I have to admit, I get why they do it. For one, it’s hard to pull yourself out of a sport you love so much. It’s also hard to pull yourself out because in many leagues, you’re competing for a roster position with all the other skaters. If you pull out, will you be considered a ‘wimp?’ I know it crossed my mind with my recent incident. Whether we like it or not, the pressure to perform for your team is there at the amateur level. And I’m sure there are many who still have the view that if you don’t have an ankle dangling from the bone or blood pouring from your face, you should be contributing. Concussions are invisible, as are many other injuries one can acquire in roller derby. Those with that kind of mindset are not only putting themselves at risk, but others who are around them as their focus and skill will not be 100%. Even if they put themselves back into the game with the best intentions, they become a liability skating injured. But Crosby is changing people’s view on such injuries, showing it’s okay to take time off, get better and you CAN come back just as strong if you stay dedicated to a plan to make yourself get better. Even off skates, he’s an amazing ambassador to sport… ALL sports… and I hope amateur coaches and players take notice. Skating with an injury is just dumb. 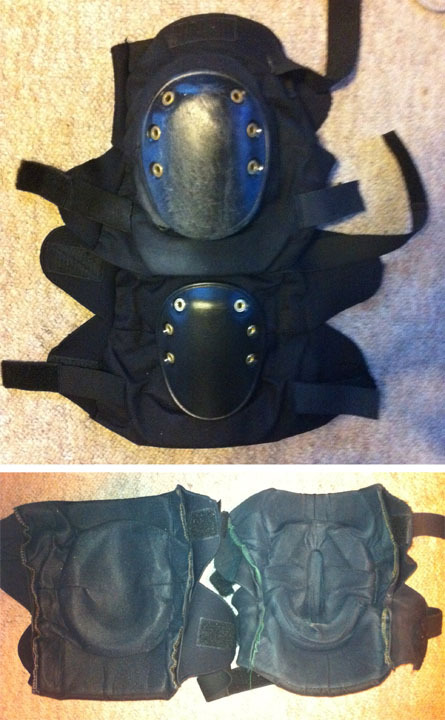 Old & new kneepads. I was most surprised how the exterior protective cap was stretched out. Speaking of injuries, I FINALLY replaced by kneepads. I honestly thought I could maybe get a couple more months out of my old ones. But looking at them side-by-side I can see now how horribly stretched out and compacted they were. 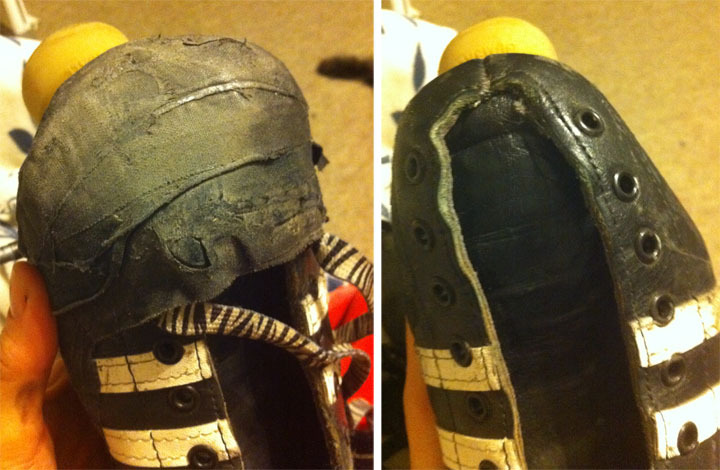 Admittedly, I added some foam of my own inside my old pads to try and extend the life. It actually worked okay and I got 1.5 years out of them. *DISCLAIMER Don’t do what I did. It was stupid and could of horribly backfired. I’m not going to try and extend the life of my kneepads by inserting foam ever again. During my week off skates I decided to give my skates some TLC. So I pulled ALL the tape off of them and I gave them some love. But it was also to give them a good inspection to see if I could get another year out of the boots. Giving some love. I had A LOT of layers of tape on my babies. I don't remember the last time they were neeked. Minor repairs aside, they’re still doing okay, but I’ve been saving some pennies in anticipation for an upgrade so I’ve decided to get some new plates. 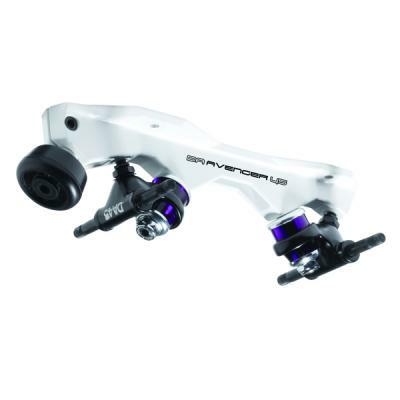 Sure Grip Magnesium Avenger with 45 degree DA45 trucks. What’s great about roller skates is that you can take them apart, so if I decide to get new boots next year, I can take these plates off and attach them to the new boots. I’ll be sure to take lots of pictures when I do the install. I hope they come soooon! Less than 20 days until the end of my year of fitness goals! I’m excited to be compiling info in anticipation of a wrap-up post for my year of fitness goals. Having to take time off for my injury has made me feel incredibly behind with exercise and diet, but yesterday I hit up the gym once again and it was like I never left! It felt great and I’m almost ready for another weight increase. 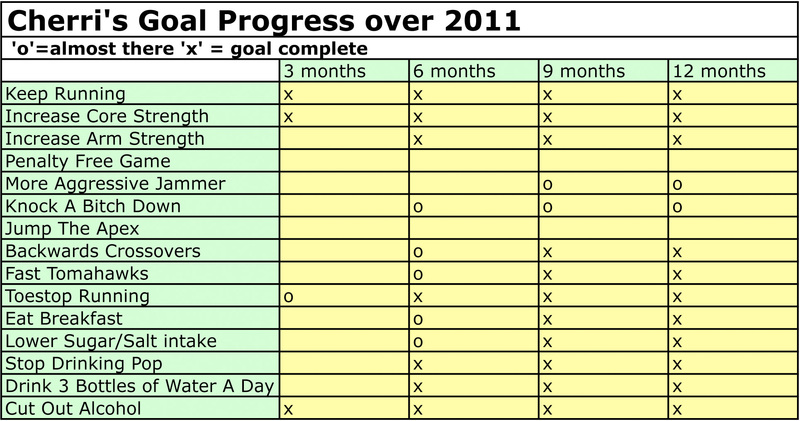 And I’m ridiculously excited to write some new goals for 2012 which will include some serious muscle-building and change in diet. Watching the skaters at the Blood and Thunder World Cup also inspired me. It’s so exciting to think many who were there competing at a national level were where I was only a few years ago. As a result, focusing on my head game and adding more skills to my tool box that I can pull out instinctually are on my list. I’ve contributed two years as a board member to the league, so I’m also looking at possibly backing down from that so I can focus more on my skating. I think that will help a lot. Thems my jumbly thoughts! I’d love to hear what you think about the pressure to play injured (Have you had pressure to do it?) or any new goals, gear, etc that you’re racing towards for the end of 2011!